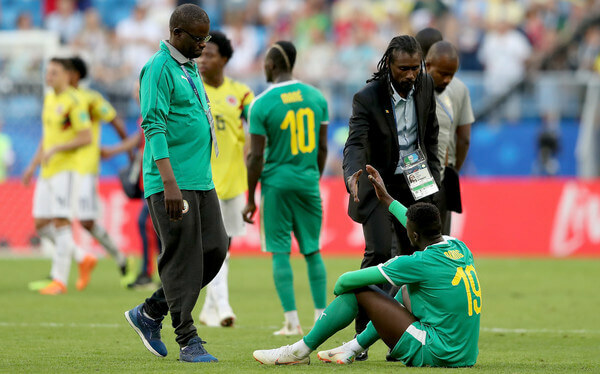 Mbaye Niang of Senegal and Aliou Cisse, Head coach of Senegal shakes hands after the 2018 FIFA World Cup Russia group H match between Senegal and Colombia at Samara Arena on June 28, 2018 in Samara, Russia. Looking at the French team’s World Cup success, statements like “Africa won the World Cup” were not absolutely shocking. This is because players of African descent or African players have made such an impact on the global football arena. That’s an idea which has been warmly embraced across the globe. However, when we look at African football managers, the story there is far from this great one. There are not many outspoken African coaches but that does not mean they are not doing as good a job. Greatness is not defined by quantity. Below, we delve into discussing some of the great African managers that we seldom celebrate. Hassan Shehata of Egypt speaks after receiving the FIFA Order of Merit from FIFA President Joseph Blatter (2nd L) during the opening ceremony of the 64th FIFA Congress at the Expocenter Transamerica on June 10, 2014 in Sao Paulo, Brazil. We are right to hear this name and be quick to associate it with the World Cup because the Senegalese coach was the only black coach at the 2018 FIFA World Cup in Russia. He was profiled for his stern attitude towards his players while making sure that details do not just pass his way without getting the attention they deserve. He was chosen for this position because he had also been a patriotic player who led his country to the quarter finals in the 2002 World Cup which was held in Japan and South Korea. His teammates have also attested to his not-willing-to-quit spirit that he possesses, even as a player. He is well able to transfer the same energy to his players by giving very inspiring speeches. The 42-year-old Cisse does not just choose the best squad but also knows how to filter his words and get the very best out of his troopers! We also got a bit of what the Senegalese players’ daily bread tasted like when he was quoted saying, “Football is a universal sport and I represent a new generation that would like to have its place in African and world football.” That is a sentiment we absolutely share with him. Coach Clive Barker of Bidvest Wits during the Absa Premiership match between Ajax Cape Town and Bidvest Wits at Cape Town Stadium on April 20, 2013 in Cape Town, South Africa. Shehata led Egypt to win the Africa Cup of Nations three times in 2006, 2008 and 2010. When you win once, we can call it fate but when you just get it right three times, it means the talent in you is unquestionable. That is one thing that the now 71-year old legend can be remembered for. As a coach, he is good at making decisions, and standing by them even when they seem to be less popular. Many of us will recall his dispute with Mido after replacing the player 11 minutes until the end of the game in the 2006 semi-finals. The striker was so displeased at the gesture as he was optimistic of getting a goal before the final whistle. They came close to exchanging more than just harsh words, but Shehata was not moved. He had made a decision that not even harsh words or more could change. He won the Africa Cup of Nations in 1996. This was particularly an important year for the whole of South Africa, who had just fought off the oppressive Apartheid regime in 1994. The country was of course in a feeble political state, and the trophy became the much needed revival. This goes a long way to show the kind of impact that soccer can have in unifying a nation. Beyond that glorious act in history, Barker also coached a number of clubs in South Africa. He won the Coca-Cola Cup with Amazulu in 1992. Under his leadership, the South African national team was ranked by FIFA as the best team in Africa and featured in the Top 20 teams worldwide in 1997. No wonder they even qualified for the 1998 FIFA World Cup finals. Those are heights that the post-Apartheid South African children are yet to enjoy. Maybe if they only had Clive to lead them there! It is always tempting to just give all the glory to the players, because they are the ones we see during the 90 minutes and forget the people who invest time in doing all the other work behind the scenes. In this piece, we remembered a fair share of some of the greatest coaches the continent has ever seen. Did Seri cut himself short by joining Premier League strugglers, Fulham?